Today is the 74th anniversary of the Shelling of Mainila. 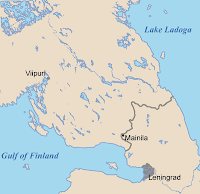 On 26 November 1939, Soviet troops shelled the village of Mainila on the Soviet side of the border between the Soviet Union and Finland. Moscow then blamed Finland for the provocation. The incident set the stage for the Soviet war of aggression against Finland, as agreed in the Molotov-Ribbentrop Pact between the Soviet Union and Nazi Germany. As we remember the Shelling of Mainila, the Finnish Anti-Fascist Committee looks forward to the 75th anniversary of the International Black Ribbon Day, which commemorates the Nazi-Soviet pact. The year will be busy for our organisation. We call on the Finnish authorities to support events commemorating the Black Ribbon Day, and call on all interested parties to join in our activities. The Shelling of Mainila is not just part of military history, given that Russia’s current strongman, Vladimir Putin, has justified the Soviet war of aggression against Finland, most recently in a speech he delivered to Russia’s official historians in March 2013. Putin’s speech reflects the new rise of Russian imperialism under his rule. It is high time for Finland and Russia to arrive at a common understanding of our recent history. We cannot go on living in fear of a new “Shelling of Mainila.” History has very concrete consequences for both the current generation and those that come after us. Remembering events like the Shelling of Mainila may help us prevent such crimes in the future.